https://qualityandinnovation.files.wordpress.com/2019/02/baldrige-burder.jpg?w=150&h=111 150w, https://qualityandinnovation.files.wordpress.com/2019/02/baldrige-burder.jpg 500w" sizes="(max-width: 300px) 100vw, 300px">It can be difficult to maintain a focus on strategic concerns when your organization is required to maintain compliance with standards and regulations. Tracking and auditing can be tedious! For example, if you’re a medical device manufacturer, you may need to maintain ISO 13485 compliance for good standing among your suppliers and customers — and at the same time, meet all the requirements of 21 CFR 820 and other regulations that govern production and postmarket. (To read more about the challenges, check out Wienholt’s 2016 post.) There’s a lot to keep track of. But strategy is important, and alignment is even more important! 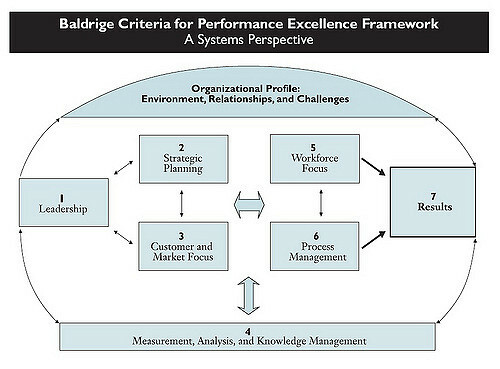 And in my opinion (and the opinion of many others who have been working in quality for a long time), the easiest way to improve alignment and get “Big Q” quality is to use the Baldrige Excellence Framework from the Baldrige Performance Excellence Program, administered by NIST.